The professionals at Ball Heating & Air Conditioning know that your heating and air conditioning are two of the most critical parts of your home, and we are dedicated to making sure that they’re always able to keep your home as comfortable as possible. That’s why our professionals strive at every single job we work to provide you with the highest quality heating and air conditioning services possible. Whether you need a full installation of a new HVAC system or just regular maintenance for your heating or cooling unit, our experts will always provide you with high quality workmanship and professional customer service. All of our contractors are licensed professionals with extensive training and experience, so we can always guarantee your complete satisfaction with all of the work that we provide. We understand that these parts of your home are extremely important to you and your family, so we always take our responsibilities seriously. We’ll do whatever it takes to make sure that your Mulvane home’s heating and cooling systems are totally reliable and as efficient as possible. Call us today with any questions you have about our services, or to schedule your appointment, and we’ll look forward to adding you to a long list of satisfied customers. During the summer months, temperatures can easily rise to around to 90° F or higher, and when they do, your air conditioner is one of the most important parts of your home. When there is extreme heat outdoors, you need to be able to keep your home cool and comfortable, but you also need to be able to keep your cooling costs low. That’s why it’s so important to make sure that any repairs you need for your AC are taken care of as soon as possible once they develop. Our professionals can provide you with prompt, thorough, and accurate repairs for any problems you encounter with your Mulvane home’s AC. We also recommend that you have your air conditioner tuned up once every year to help prevent any serious problems from developing and to keep your AC as energy efficient as possible. If you have any urgent problems with your air conditioner, our professionals offer 24/7 emergency repairs as well. When the winter months reach their coldest temperatures, you need to ensure that your home’s heating is totally reliable. Problems with the heating in your home can more than just a discomfort, and often they’re a serious threat to your family’s safety and health. The professional heating contractors at Ball Heating & Air Conditioning can make sure that your heater is always able to provide you and your family with the comfort and security that you depend on from your Mulvane home. We can work with any kind of heating unit, including central heat, heat pumps, boilers, furnaces, and more, and we always guarantee your satisfaction with all of our work. 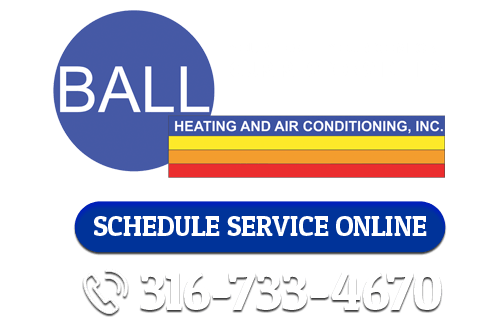 If you’re looking for heating and air conditioning services in Mulvane, call Ball Heating & Air Conditioning at 316-733-4670, or fill out our online request form.